Colonial Quills: Jean Lafitte – Pirate, Gentleman, or American Hero? Jean Lafitte – Pirate, Gentleman, or American Hero? Jean Lafitte is one of the most fascinating figures in American History. Though he first appeared in New Orleans in 1803, no one knows where he came from. A fugitive from the slave revolts in Haiti? The son of aristocrats guillotined during the French Revolution? He gave different accounts to different people depending on his mood and need. However, it is undisputed that he must have at least grown up in the New Orleans area due to his knowledge of its marshes and bayous and his ability to speak French, Spanish, English, and Italian! By all accounts, Jean Lafitte was a pirate, although he claimed to have a letter of marque from Columbia to act as a privateer against Spain. He created a haven for pirates on Barataria, a tiny islet south of New Orleans, where he built houses, a café, gambling den, and a brothel. He was the leader of close to 1000 men on that colony and even devised a set of rules for them to live by. Hanging for murder, being cast adrift for molesting a woman, etc. . . Lafitte prized the American Constitution for the freedom it gave its people and he, therefore, prohibited his men from attacking American ships on pain of death. 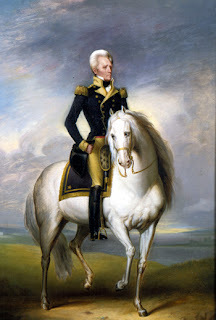 Regardless of his loyalty to America, the governor of Louisiana, William C.C. Claiborne, offered a $500 reward for Lafitte's arrest. Within a week of the notices, new wanted posters appeared, offering $1500 to anyone who delivered the governor to Barataria!! Signed by Jean Lafitte, of course! When the War of 1812 ravaged through America, Jean Lafitte sought out Andrew Jackson and offered his assistance. Though Jackson initially was against accepting help from the “hellish banditti” he relented because of the vast amount of ammunition and men Lafitte offered. As it turned out, the British would not have captured New Orleans without the pirate’s help. For this, President Madison pardoned Lafitte and his men. After the war, New Orelanians became less accepting of privateers and smugglers and Lafitte moved his colony to Galveston island. Though the colony initially prospered, by its very nature, it attracted villains and fugitives who refused to obey Lafitte's laws. In 1821, the American Navy demanded the renegades leave the island or be blown to bits. Lafitte set his stronghold aflame and disappeared under the cover of night. What happened to Jean Lafitte? Did he continue on with his piracy in other parts of the world? Did he retire and raise a family in some obscure town in Virginia? No one knows. Which simply adds to the mystic and allure of the legend. This always fascinates me whenever I read it. I love the part where he puts up a reward for the governor's capture. Thanks Debbie! I'd love to write a novel about him some day! That sounds like a great idea! Such a mysterious and colorful character. I'll be at the head of the line to read it, MaryLu! And I'll be right behind you, Debbie! So, MaryLu, you need to get started. Someday is upon us. The most I knew about Lafitte was his involvement with the Battle of New Orleans. I didn't know he 'disappeared into the night'! Shiver my timbers, MaryLu, what a fascinating post. Interesting code of ethics, he owned a brothel yet wouldn't tolerate the molesting of women. Love me some pirates - argh!!!!! Great post today - fun Saturday reading.